Some questions are a lot easier to answer in the affirmative than others. Recently I was asked by Philip Coggan if I could run an interview he did with one of my favorite authors, Timothy Hallinan. The interview will be run on a few blogs simultaneously. Tim’s a great author and an all around good guy who, like me, splits his time between California and South East Asia. He has a new book out called HERBIE’S GAME. If you have not read a Timothy Hallinan book yet, now is a good time to start. If you have, you know what to expect. HERBIE’S GAME is gathering typical Hallinan rave reviews. HERBIE’S GAME has been chosen as one of the coming summer’s top ten thrillers by ENTERTAINMENT WEEKLY magazine and as one of the ten best thrillers for July by Amazon. It’s also been selected as an IndieNext book of the month by the U.S. association of Independent booksellers. 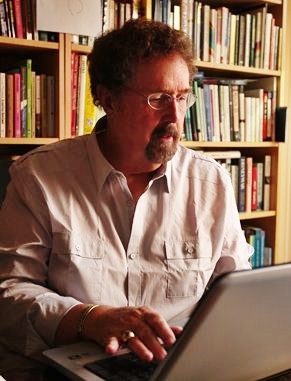 You can read a review of HERBIE’S GAME here at BookPage.com under the heading, A Mentor’s Mystery. Tim Hallinan (his excellent Blog Cabin here) began his career as a writer in the 1990s with the distinctly noir Simeon Grist series. In 2007 he began a second series, set in Bangkok and featuring “rough-travel” writer Philip (“Poke”) Rafferty and his attempts to cobble together a family comprising a former go-go dancer and a precocious street urchin named Miaow. In 2011 he returned to the Los Angeles setting for third series starring Junior Bender, the best private detective a mobster could have. The second Junior,” Little Elvises”, has just been nominated for the Shamus Award as Best Private Eye Novel of 2013. “Herbie’s Game”, the fourth in the Junior Bender series, will be appearing in mid-July, to be followed in November by the sixth Poke Rafftery. Tim, can you tell us a little about “Herbie’s Game”? 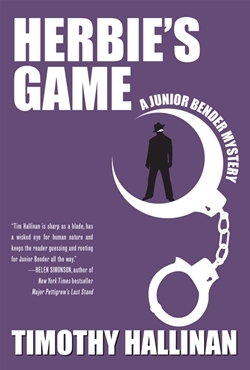 TH: HERBIE’S GAME is the fourth in my series of books about Junior Bender, a first-rate Los Angeles burglar who moonlights (when forced to) as a private eye for crooks. He’s been the smartest guy in the room for most of his life, and that hasn’t gone unnoticed by the thugs in his (anti)social circle, and when one of them becomes the victim of a crime or a threat, they know they’re not going to get a sympathetic, gee-we’d-better-solve-this-tout-suite reaction from the cops, so they turn instead to Junior. What this usually means that he’s in danger of being killed by the culprit if it looks like he might succeed, on one hand, and–on the other hand–in danger of being killed by his client if he fails. So in addition to solving the crime, Junior has to pay a lot of attention to staying alive. In HERBIE’S GAME, a continuing character, a sort of executive crook named Wattles, finds his office burglarized one fine morning, and the only thing missing is a piece of paper on which he unwisely wrote the names of the crooks in a chain he was using to pass along to a hitman the name of the victim and the payment. The chain guarantees that the hitman has no idea who hired him and it also builds an ideal defence case for Wattles because if things go awry, all the prosecution witnesses will be convicted felons, and as one character says, defence lawyers have a word for such trials: they call them acquittals. Wattles thinks Junior might have committed the burglary, but Junior knows immediately that the thief was his mentor, the legendary Herbie Mott, who took Junior under his wing when Junior was only seventeen and became a surrogate father to the budding burglar. And then Herbie shows up dead, with no stolen piece of paper in sight, and Junior knows that he has to follow the names in the chain to get to Herbie’s murderer. As he does, he begins to find that Herbie may have been a very different kind of man that Junior thought he was, and Junior has to ask himself how much of the life he’s living — a life that frequently leaves him feeling unsatisfied and adrift — is his own invention, and how much of it is just Herbie’s game. Sorry to rattle on at such length. “Herbie’s Game” is a very funny book, and the humour derives mostly from the characters. In fact I get the impression that you enjoy writing bad guys more than good guys. What is it about crooks that excites your imagination? TH: They have a special energy. They don’t have to be politically correct, or even polite. They can say whatever they want. They can go from A to D without bothering with B and C. Best of all they have highly personal and idiosyncratic moral codes, which they frequently invent on the fly. In my non-Junior books, I usually have to work to keep the bad guys and gals from taking over. I decided to deal with that issue by writing a series that’s essentially all crooks, and writing them makes me very, very happy. Another thing I like about writing the Juniors is that, for all of us, whatever we’re doing makes sense to us. I think much of what the characters in these books do, sometimes on a daily basis, skirts the fuzzy edge of insanity, and part of what makes their characters so much fun to write are the internal justifications and accommodations they’ve made in order to accept the things they do. But when the tide goes out and they’re old, like Dressler or Burt the Gut, what’s left is just a normal person, usually not very happy. You also have an amazing rapport with female characters – I’m thinking Dolly’s adolescent beginnings in the movie game in “The Fame Thief”, Rose’s journey from village beauty to Bangkok bargirl, and the daughters of Junior and Poke. It feels since QUEEN like I’m writing women all the time, and it’s great because it’s opened up a whole range of stories I couldn’t have written otherwise. And as for Miaow, she’s always been the easiest character in the series because she always, always has an agenda. And I can’t say much of anything about THE FAME THIEF — that whole book arrived by air mail. I just wrote as fast as I could to keep up. 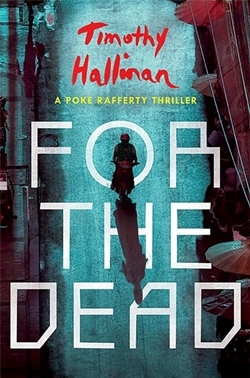 Your second book this year is “For The Dead”, the sixth in the Bangkok-based Poke Rafferty series. Can you tell us something about this? It seems to me that each adventure in the Poke series centres around Poke’s attempts to create a family in the midst of a world which is essentially malignant. Poke wins every battle, though only just, and with each victory his private world of love and family is strengthened. What’s your own take on the world of the Poke series? TH: You’re spot on. I think of it as a series about three people who have unexpectedly been given a second or third chance at a kind of life they thought they could never have. It’s almost an accident that the family is so central. When I wrote the very first book, I wanted to make it clear from the beginning that this was not a me-love-you-long-time book in which beautiful brown women fall helplessly and inexplicably in love with uninteresting white males. So in our first glance at Poke ever he’s holding his daughter’s hand and following his wife as they go grocery shopping. And then Miaow takes off after Superman and the center of the book’s interest shifts to that apartment. I had to fight to keep the thriller moving forward. If I have my way I’ll write the series until Miaow moves out, at 19 or so, leaving Poke and Rose behind. One of things I like best about the Pokes is that in the middle of the city of instant gratification you’ve got three people clinging for all they’re worth to the middle-class ideal of a functioning, loyal family. Both the LA and the Bangkok series seem to me to be extremely visual and filmable. Who do you see playing Junior – Johnny Depp? How about Poke –give Owen Wilson a try on that? TH: Boy, you got me. The Pokes were bought for cable although the experiment failed, and the Juniors have been optioned a couple of times. I’m hampered in my attempt to answer this question by the fact that I watch almost nothing. Poke is part Filipino, so someone with some Asian blood would seem to be called for. Keanu Reeves looks interestingly battered in the fascinating documentary he directed about the transition from film to video. There’s an actor attached to Junior right now, and while I can’t say who it is (in case it falls through) he’s no one who would come immediately to your mind. I think he’s got to project intelligence; someone once suggested Joseph Gordon-Levitt, and when I saw him, I thought he’d be great. With two books out this year, what’s next? I understand you’re working on a return of the main character from your very first series, Simeon Grist, in what sounds like a very novel scenario. Any news on that? TH: The seventh Simeon, PULPED, has been finished for more than a year but so far it’s unsatisfactory to me, although I think about 80% of it works. What happens is that Simeon has been banished to a kind of limbo that’s reserved for the heroes of unsuccessful crime series. When the last unsold copy of the final book in the series is pulped to make paper for a new (and presumably better) book, pop, the character finds himself stranded, possibly forever, in the environment his/her author created as the primary setting, in a kind of gerrymandered neighborhood where everyone else is also the hero/heroine of discontinued crime series. This is kind of a shock to begin with because fictional characters don’t know they’re not real until they’re suddenly in limbo, severed from the real world. The only connection with the world in which we live is when someone down here opens one of the books in the series, at which point Simeon (or the hero of whatever book it is) can look up, so to speak, through the page at the person who’s reading it. He’s doing just that when someone kills the reader. He doesn’t have enough readers to take this lightly, so he has to find a way down there and find out whodunnit. That gives me a chance to write a lot of (to me) very funny and quite difficult scenes between a real person and a fictional one, including a love affair. If I had a month I could (and eventually will) rewrite the first 25%, which is where the problems are. So this July, HERBIE’S GAME comes out, and in November it’s FOR THE DEAD. At the moment I’m writing the seventh Poke, THE HOT COUNTRIES, and the fifth Junior, KING MAYBE. God willing, they’ll both be good. I think it was Dorothy Parker who said something to the effect that she hated writing but loved having written – meaning, I guess, that writing is hard work. P.G. Wodehouse in contrast brought out slightly more books than he had years in his life. Are you a Parker or a Wodehouse? TH: Writing is very hard work and enormous fun at the same time. There are days when I’d rather be a lab rat than write, and there are days when writing is the only thing in the world that matters to me. I hate to do it and I love to do it and I can’t imagine doing anything else. Every day we see articles about the demise of traditional bookstores and publishers in the face of Amazon and Kindle, and even warnings about the death of books. Joe Konrath, of course, feels that books and writers will get along very well without publishers and booksellers. You yourself brought out Junior as a self-published ebook series before switching back to traditional publishing. Where do you see the future heading? TH: I’m no prophet, although I think the growth of online commerce of all kinds is inevitable, barring some absolutely horrific systemic security breach that drives people back to the stores. But where you buy the book or what format you buy it in–both those things are just delivery systems for the text. And I think that text is alive and well and will continue to thrive as long as people want to tell and read (or hear) stories. This interview may also be read at Chiang Mai City News by clicking the above banner.